CarGurus has 2,478 nationwide 2 Series listings starting at $11,400. The BMW 228i returns in its sophomore year with a Track Handling Package that really ups the automotive ante for sport luxury compacts. Just one year after its debut, the 2 Series is back to prove that you sacrifice very little when buying an "entry-level" BMW. The Track Handling Package adds transformative features like M Sport Brakes, an adaptive suspension, variable sport steering, and some sport tires to drop the 228i on virtual rails, although smart buyers will recognize it as nearly identical to last year’s Dynamic Handling package. With near-perfect weight distribution and the best steering feel in the industry today, the smallest BMW may just be the most exciting. More than any other manufacturer, BMW has taken steps to make sure its automotive offerings are instantly recognizable. Morally lax owners have often taken advantage here, stripping the badging off their Bimmers in hopes of passing off their 3 Series as a 5 Series or higher. The 228i is here to change that, as there should be no shame in owning the smallest BMW. While the 228i was never a slouch, a couple of small changes bring Bavaria back to the forefront. Sport tires and a mechanical steering rack mean you get all the feel and precision you’d expect from a BMW, and an adaptive suspension means you can make as much use of that information as you dare. The 228i feels instantly BMW, from the sight to the sounds and certainly including the steering. In short, this is one of the most intuitive cars I’ve ever driven. It might as well be called a confidence-boosting machine. In addition to the Track Handling Package ($2,200), this 228i was delivered with a Driver Assistance Package ($950) that added a rear-view camera and Park Distance Control, features I would gladly leave off to save a grand. 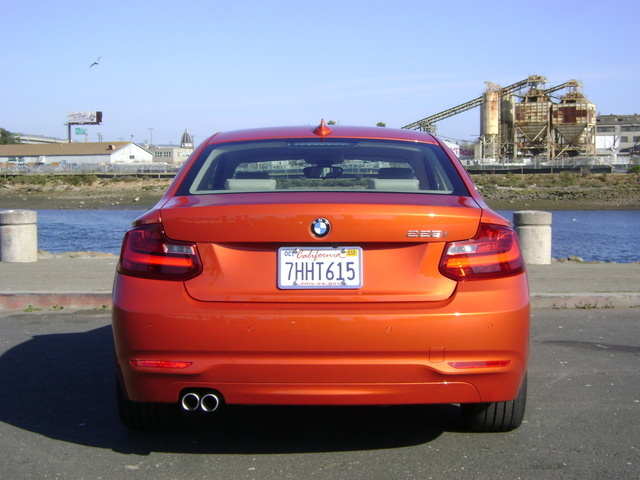 And while I cringe at paying extra for paint, the Valencia Orange ($550) treatment this 228i came with grew on me like a fungus over the course of the week. Upon delivery, my only thoughts were, “Orange! So impossibly orange!” By the end of my time with the BMW, I couldn’t stop looking. From the $32,100 MSRP, the options and Destination Charge ($950) brought the delivery price of this BMW to $36,750. Let’s get power out of the way early so we have more time to talk about the chassis, suspension, and steering, yeah? The 2.0-liter turbo in the 228i is everything a 4-cylinder engine should be: small, light, and shockingly smooth once the revs creep. A well-tuned 4 should hum like a sewing machine in the high rpms, and this engine does just that. The twin-scroll turbo mitigates low-end lag nearly flawlessly, and with 258 lb-ft of torque arriving at just 1,250 rpm, there's plenty of fun to be had while you wait for the 242 horses to gallop onto the scene at 5,000. From there, they'll carry you all the way up to the engine's 7,000-rpm redline, screaming every inch of the way. Try that in an M235, with its nearly 2,000-rpm power gap. On top of that, it sounds fantastic. Really fantastic. So fantastic that it took me a day to consider that the 2.0-liter in this model sounded a lot better than previous examples I've put through the proverbial paces. A quick glance through BMW press releases didn’t mention the sacrilegious Active Sound being utilized in the 228i, but something wasn’t right. 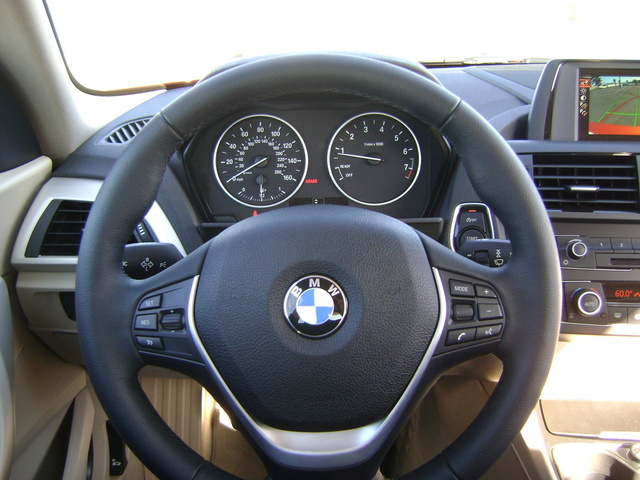 For those unfamiliar, Active Sound is the BMW version of a technology being used by many auto manufacturers to artificially amplify engine noise inside the cabin without disturbing pedestrians. Here, engine sounds are pre-recorded and stored in the vehicle’s computer to then sync with and supplement actual engine noises by playing them through the stereo. It’s a disingenuous bit of engineering, like a pushup bra for your car. It took many phone calls, and a bit of prodding, but I eventually got a BMW rep to admit that the 228i does indeed have Active Sound as a feature. What a shame. That said, if you can look past the acoustic misdirection, the sound coming through those speakers really is quite nice, and the engine has the performance to back it up. Besides, as good as the engine is, the chassis is even better. It's as neutral and composed as anything I've ever driven and manages to stay balanced all the way up to and beyond the limit. Here with the Track Handling Package it pairs perfectly with adaptive dampers that were able to soak up road inconsistencies with ease, never disturbing the composure. Add in an actual mechanical steering rack, and you’ve got one of the best setups available. Still not convinced? 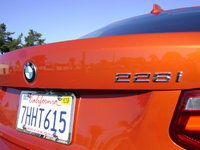 How about this: The 228i bests the 328i in every measurable performance category. It’ll get to 60 mph seven-tenths of a second quicker than the 328, hitting that mark in 5 seconds flat. The quarter-mile is reached a half-second faster as well, coming in at 13.8. It just manages to edge out the 328 in braking with a 106-ft strip from 60-0 mph and completed the Figure 8 a tenth of a second quicker as well. Sure, these improvements aren’t going to change your world, but better is better. The function of the 228i is to drive effectively and enjoyably. It achieves this goal with near perfection. It looks great doing it, too. The Valencia Orange paint this particular example came clad in was jarring at first, but I came to love it over the week. I’m sick of seeing the same colors on every car, especially higher-end cars that seem to think variety consists of a dozen different versions of white and black. 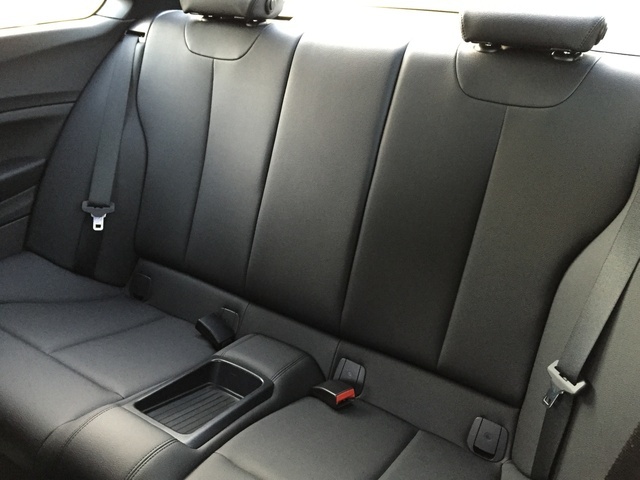 Standard leatherette is a nice feature, and fooled all of my passengers, some even commenting on how nice the leather felt. Personally I would’ve preferred something darker to go with the orange paint, or even the classy cloth I found in the i3 I tested. But the seats were comfortable and supportive, able to handle very spirited driving as well as extended highway seat time without any numbing of nether regions. 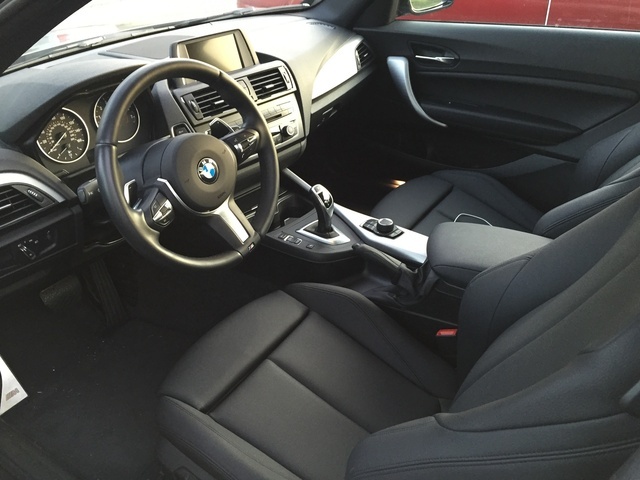 Some people wouldn’t drive a BMW without the optional sport seats, but you’re going to have to pay more for those. The clutch engages with ease but enough bite to feel some authority, and the shiftgate provides assertive gear changing without feeling notchy. Everything is placed in easy proximity to the gearshift, so your hand never has to wander far to make changes, and visibility is great. The back seat is predictably useless for a coupe, which is a fault I can forgive, but the metal-painted plastic trim is ugly and out of place at this price point. That's a shame, because some wood trim would’ve really classed up the joint. While the 2 Series can be decked out with a long list of tech, there's no need to weigh it down with such frivolity. However, if your soul is moved just as much by electrons as horsepower, check out the Technology Package for an upgrade to an 8.8-inch infotainment display with iDrive Touchpad, navigation with real-time traffic info, BMW's suite of online services and apps, and enhanced smartphone integration. The rear-view camera and park-distance control added here with the Driver Assistance Package were decidedly unnecessary. There are no visibility restrictions with the 228i, and that’s an easy way to shave $1,000 off the delivery price. However, you can also upgrade to the Driver Assistance Plus Package for lane-departure warning, active blind-spot detection, and real-time speed-limit info if you have no qualms about the purchase price climbing. But the added tech with the Track Handling Package is what really makes this 228i distinctive. Adaptive dampers react more quickly than you could ever hope to, and the variable steering provides seamless amplification. I’d like to see more common features like keyless ignition and entry come standard, but it's nice to see the more exotic options like an auto parallel parking system, concierge services, and heated front seats (not exactly a big seller in California) offered as standalones. One bit of splurging I might fall victim to is the 16-speaker, 600-watt, Harman Kardon stereo. If you're going to be forced to listen to amplified engine sounds, you might as well make sure they sound as good as they can. The National Highway Highway Traffic Safety Administration has yet to review the 2 Series, but safety hasn’t been much of an issue on these cars. The Insurance Institute for Highway Safety awarded the 2 Series its top score of Good for front, side, and roof impacts, as well as for whiplash protection in rear impacts. All good news. In addition to the federally mandated safety features, the 2 Series can be optionally outfitted with lane-departure warning, blind-spot monitoring, and automatic collision notification. And let me further offer that while the M Sport brakes are an obvious safety feature, in reduced distance and brake fade, the suspension and steering should be included on this list as well. Accident avoidance is more than just good braking, after all. Sure, there are cheaper cars out there, but the 228i is hardly a bank buster. The Track Handling Package is well worth the extra 2 grand, and if you leave off the Driver Assistance Package, you’ll be settling around $35k. The fact that the entry-level BMW is the best driving BMW and still returns mid-30s on the highway is worth a lot, too. I’d like to see keyless entry and ignition as a standard here, and it’s a feature you’re already seeing included on much lower-level cars. Consider that and whether or not you have to have the optional sport seats when calculating costs, but even with those drawbacks I’m hard-pressed to find another car I’d rather spend my money on. In fact, in order to get the same level of driving performance and enjoyment, you'd have to spend a lot more and still wouldn't find it. 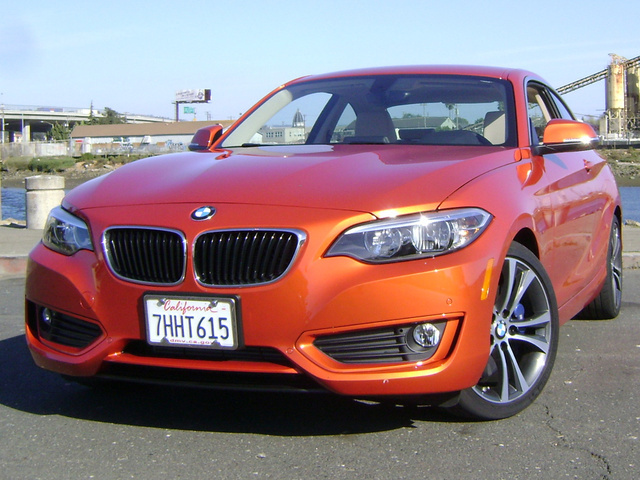 What's your take on the 2015 BMW 2 Series? Users ranked 2015 BMW 2 Series against other cars which they drove/owned. Each ranking was based on 9 categories. Here is the summary of top rankings. 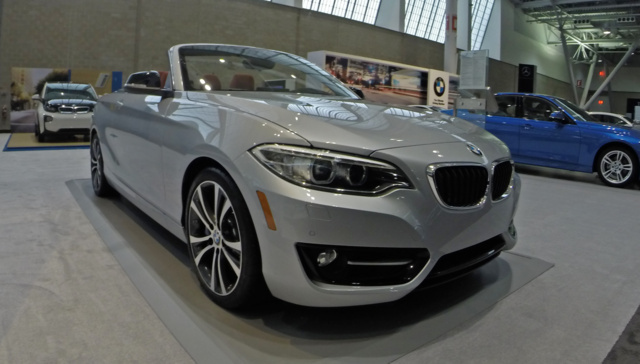 Have you driven a 2015 BMW 2 Series? I just bought a bmw 2 series 218d sport line coupe 15 plate. The idrive system appears to be greyed out and will not let me select it. Does anyone know why this might be? Thank you in advance. 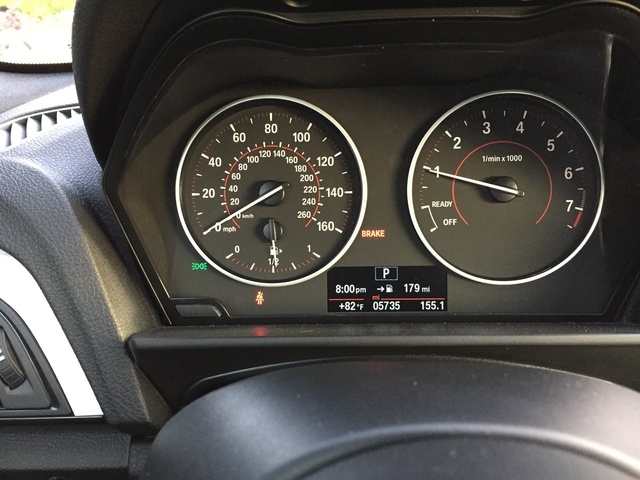 How can I do a software reset on my car? Is this something only BMW can do? I would like to see the car posting of the car that I bought 3 week ago. 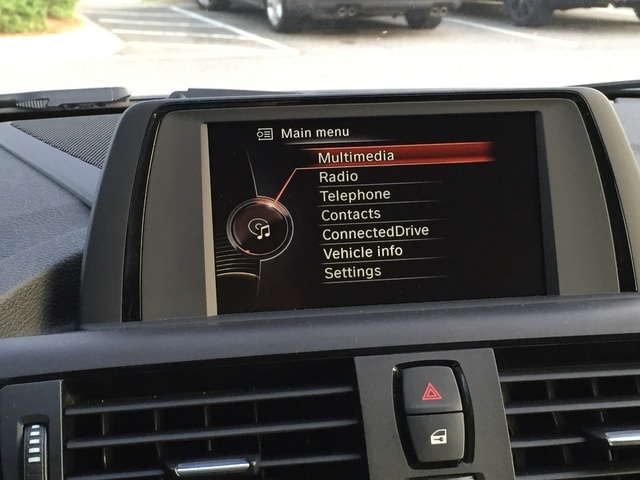 Want to add navigation to 2015 BMW.I have the backup camera just want navigation Can this be done and approx. cost if possible.